WW1 Reenactments Equipment : Great War Tommy WW1 Documents, Paperwork : Casualty label / Diary of Transference. WW1 Reproductions and WW1 Reenactors Equipment / Kit - Casualty label / Diary of Transference. Casualty label / Diary of Transference. Army Form W 31188. 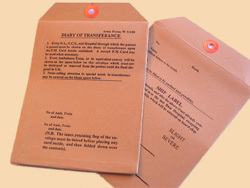 Casualty Envelope for the Field Medical Card of evacuated wounded. Includes diagnostic details from F.A. - C.C.S. - Ambulance train - Hospital Ship, etc. As tied to jacket of 'walking wounded', etc. Includes 1916 Field Medical Card.